No pastiche elegance, asis so often the case, the happiest day of your life, but the real thing. The aesthetic of the goldenage of art, the glories of the past can provide a unique and perfect background for your marriage day. Allow your self the luxury of being immersed in the centuries-oldtradition, history and taste of a noble family. The Contucci family still living in the residences which are available to guests. 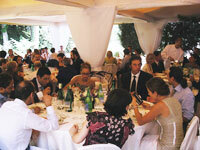 This special personal attention will make your wedding day just like one of the family occasions celebrated here. The bride can spend the night on the eve of her wedding day in the Nymph’s Alcove apartment at Palazzo Contucci (see the website for a description of this elegant and sophisticated apartment). 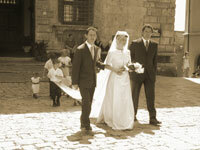 The bridegroom and the parents can avail them selves of two well-appointed apartments belonging to Gigliola Contucci a mere 300 yards away from Palazzo Contucci (www.angoloallafortezza.it). Naturally this accomodation can also be used for the night of the wedding, as a worthy way to end the uniquely special day. 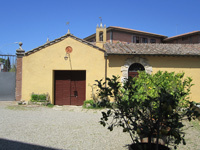 The Contucci family will lay on in the rooms some delicious Vino Nobile as well, of course, as …..bubbly! In the morning the bride can be dressed and have her hair done in her apartment. Before making her exit from the Palazzo photographs can be taken with the family in the Renaissance Courtyard by Sangallo and/or the eighteenth-century Sala della Feste painted by Andrea Pozzo. With Palazzo Contucci being right on Piazza Grande, every year visited by thousands of tourists for its spectacular beauty, our guests have the very special opportunity of arriving on foot at the Cathedral and Mayor’s office, both right next to Palazzo Contucci. The piazza seems more of a stage backdrop than a reality, and is factof tenusedas a film set (The English Patient, Twighlight) or for commercials (Mulino bianco, Mercedes…), for theatrical performances, ballets, concerts and a thousand ther events. You can for once be the leading lady, the fairy princess who step sacross her palace’s thres hold and goes to meet her prince. How …? On foot, on horseback, in a period carriage…let your imagination run wild and your dream come true! 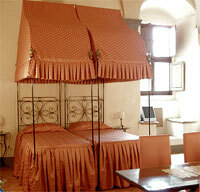 The eighteenth-century Villa Contucci is situated five kilometres outside Montepulciano. In the surrounding grounds there is a family chapel, the imposing Carp Pond typical of the noblemen’s villas, a Giardino all’Italiana with geometric beds filled with brightly-coloured gerberas, the Boschetto for shade when “the sun is over bearing” with its flowing brook, the Limonaia, the kitchen garden for home produce, and the Orchard, in spring a riot of blossom and in summer bountiful with plums, cherries, crab, apples and pears.